How to fish from a Kayak? 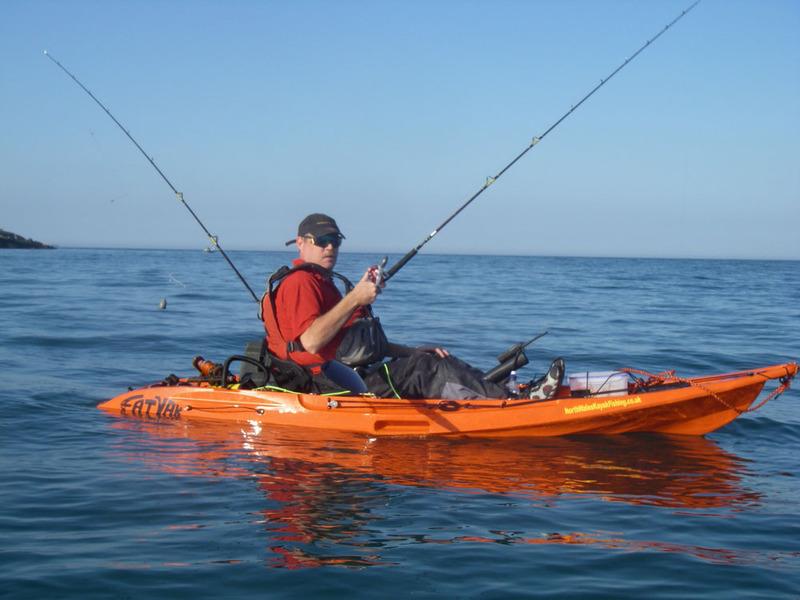 Kayak fishing is gaining much popularity in Europe and America. 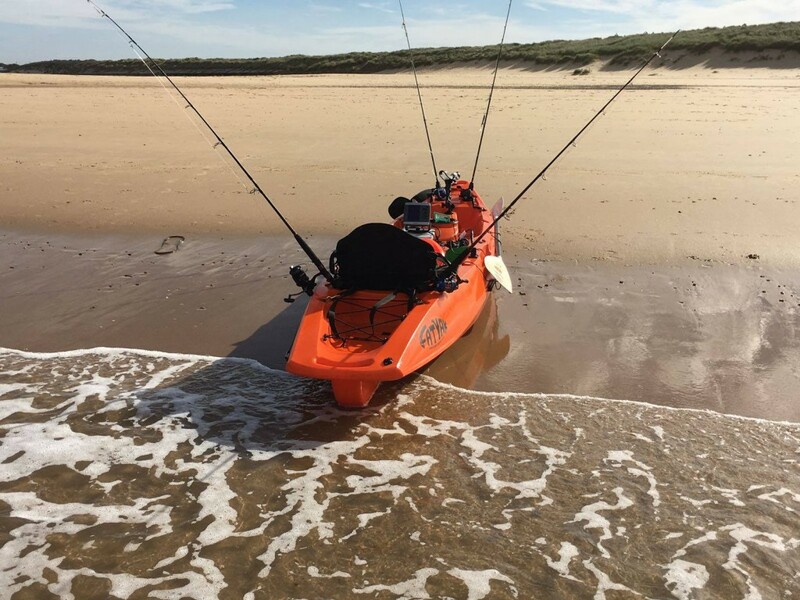 Fly fishing from a a kayak has the advantage of getting much closer to the fish you are trying to catch, as well as giving you the opportunity to drift or paddle to alternative locations should you desire. Avoid Clutter: The more things you have on deck, the more likely your lines will snag or you will lose equipment overboard! 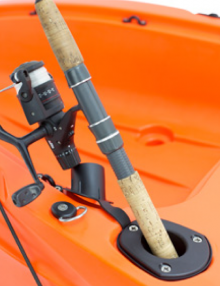 Rod holders: You might need a special type of rod holder for a fly rod and reel. Fly casting: It is definitely worth investing in some coaching to learn how to cast a fly line. Fly casting from a kayak is more difficult because you are usually sitting down. Drifting: Drifting whilst you are fly fishing might be an issue for you, especially if you are drifting fast. One solution is to use a sea anchor (or Drogue). 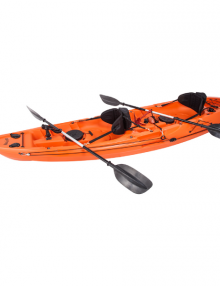 This acts like a parachute in the water behind your kayak. The bigger the drogue, the more effective it will be at slowing you down. You don’t need specialist tackle to fly fish from a kayak – an ordinary fly fishing outfit will do just fine. If you are going to try saltwater fly fishing, then you should use tackle which will not rust. We would also strongly recommend a small folding net which will come in handy when scooping fish out of the water. 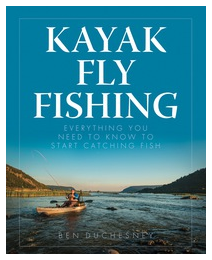 If you are interested to know everything there is to know about Kayak Fly Fishing, then this book might be of interest to you. It has a in-depth section about technique as well as going into a lot of detail about the specific gear required. Kayak fishing requires skill and patience, but is highly rewarding and can turn into an addictive sport once you get a few bites! Legering is a method anglers use in fishing a static bait on the bottom of a lake or river bed. It doesn’t use a float (unless you are float ledgering) but consists of using a weight on the main line and other methods of bite detection such as a swing tip or quiver tip or bite alarm. The weight is used to aid casting and hold the bait in position on the lake or river bed. 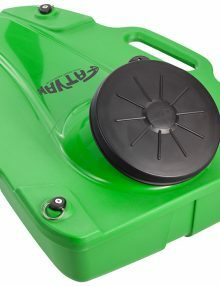 It is a good method to use when the weather conditions are windy, or alternatively in fast running water when fishing with a float becomes more difficult. There are two main methods of ledgering: Fixed Lead and Running Lead. This page, (www.fish-uk.com) provides a more detailed insight into the two variations of ledgering and how to set up your line, bait and weight. When the surface of the sea or river bed is very rough, ledgering is not a suitable method. Float fishing in this instance would be a better choice. It is a satisfying way of fishing, as you can watch your float bob and then disappear when you have a catch. The most versatile method is to use a sliding float. This allows the bait to be fished at any depth using a moveable stop knot. Slide a bead up the mainline. Slide the mainline through the inside of the float. Add another bead up the mainline. Slide the weight on the mainline. Slide another bead on the mainline. Tie a swivel to the end of the mainline. Tie a length (3 feet) of weaker line to the swivel. Attach a hook to the end of the weaker line. Tie a stop knot on the main line above the float. The position of the stop knot determines the depth at which the bait will fish. A multitude of techniques is covered by spinning, all of which involve casting and retrieving the bait. The bait can be real or artificial, but it is kept on the move by constantly reeling in. Softbaits – latex lures – shads etc. Weather you use real or artificial baits, spinning can be one of the most exciting methods of fishing. Due to the constant casting and retrieving, there is less sedentary waiting around, and more action, which makes it great for beginners and youngsters. 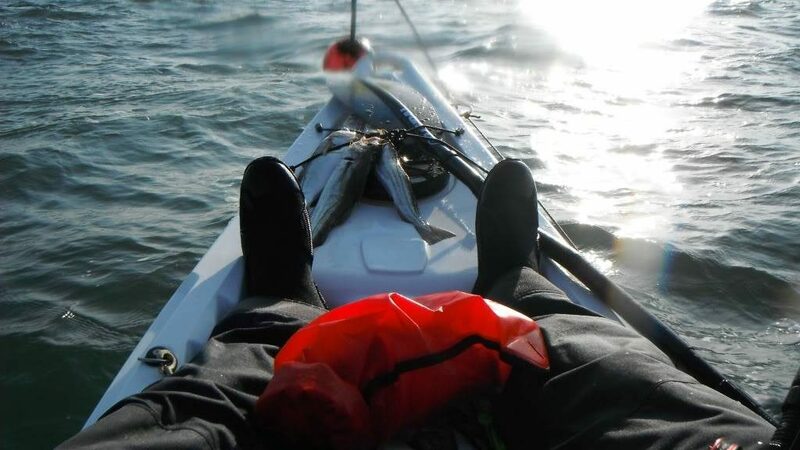 Not to be confused with trawling, in this instance, trolling a method of fishing when one or more baited lines are drawn through water from the back of your kayak. 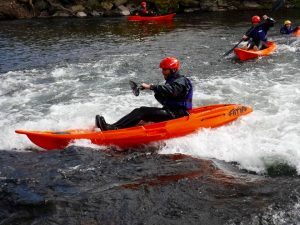 You must be confident paddling in choppy conditions and fast running water, as well as be confident turning and recovering from a capsize before you begin fishing from a kayak. Image courtesy Channel Adventure. Paddle Skills: Basic paddle strokes and bracing. 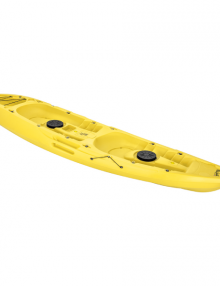 Self rescue: How to get back on the kayak when (!) you fall off. 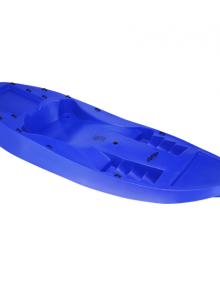 Capsize drill: How to right a capsized kayak. 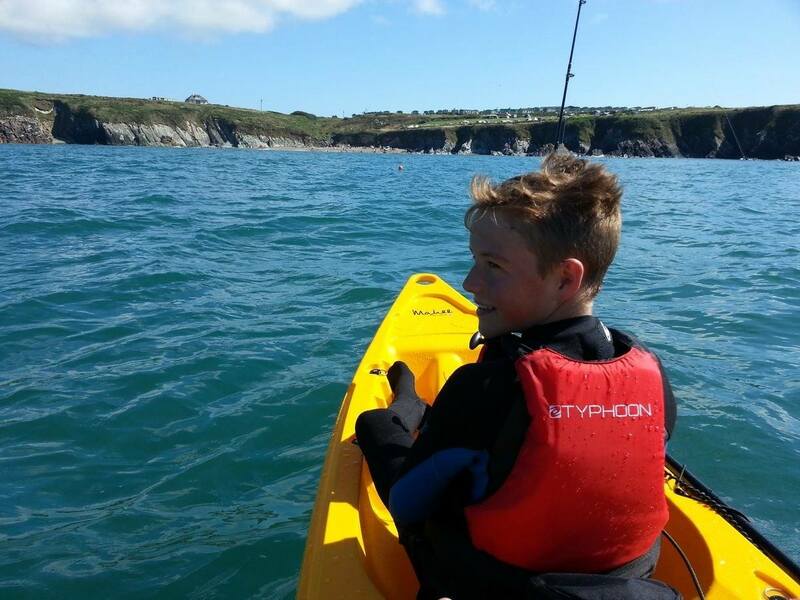 Surf entry and exit: How to control the kayak when entering and exiting the surf. 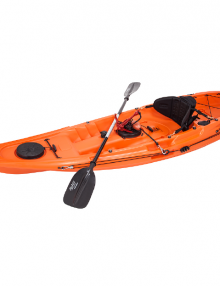 Once you are comfortable with those skills and have been out a few times on the water with your kayak to practice, it’s time to think about your equipment. 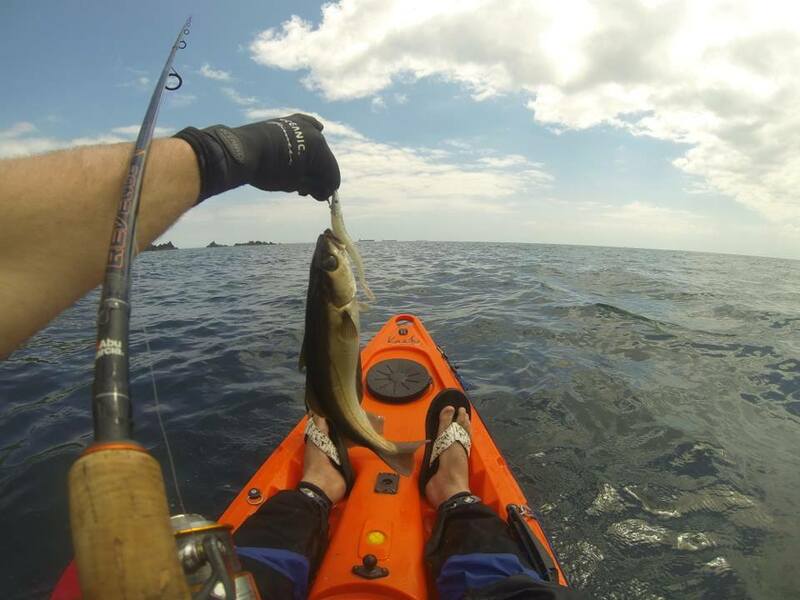 Kayak fishing is not a cheap sport – you have been warned! However, once you have bought the essentials, most of it will last many years. 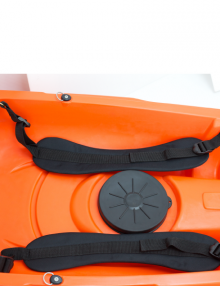 PFD – A Personal Flotation Device. Wear this at all times – it will keep you afloat if you capsize. Keep your PFD knife, Radio/Mobile, Whistle and torch (if it fits easily) in or attached to your PFD so that you have these to hand in the case of an emergency. Do not put anything heavy in the pockets. 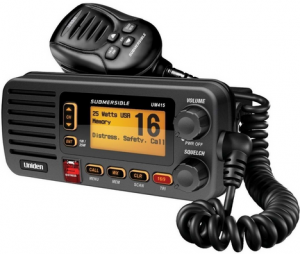 VHF/DSC Radio – A portable waterproof VHF or DSC (digital) radio will mean you can send a distress call to the local coastguards and surrounding vessels immediately without needing signal on your mobile phone. Important: It is no longer a requirement for coastguards or shipping vessels to manually look out for VHF calls on channel 16. Instead, commercial ships and the Coastguard now monitor a special digital channel with DSC radios. In order transmit a distress message on this channel you will need a DCS Radio. The RNLI have a great article on this topic here. Whistle – Attach this to your PFD. This is a good way of attracting attention of nearby vessels or people onshore. Flares– A set of in-date flares. The day/night type are the best. Make sure they are protected in a waterproof tube. Here is an example. Some kayakers also carry high intensity chemical lightsticks in the back of their PFD, like these. Mobile Phone – You may well not need a mobile, but it is always good to have a backup communication device. Keep it safe in a watertight case or bag. 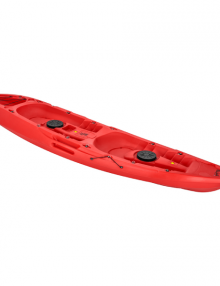 PFD Knife – This is a knife that is always attached to your PFD. It doesn’t need to be too sharp (in fact, it’s safer if its not) and it’s use is to cut lines if you capsize and are tangled. GPS – A GPS will tell you your location, speed, where you are heading, and how to get back. 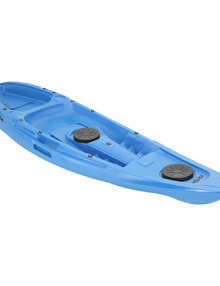 Make sure it is waterproof and has fresh batteries and is leashed to your PFD. Prices range from around £100. Click here for some good examples. Compass – You should always have a compass (and know how to use one) to help guide you back to shore in the case of your GPS failing and visibility is poor. Never set off (especially to sea) without knowing which bearing you came from and intend to head back to to safety with. Remember a compass will not work correctly close to metal objects. Waterproof Torch or Strobe Light – To be seen in poor visibility or when having given a distress signal. Attach this to your PFD. Here is an example. Appropriate Clothing – This will entirely depend on the weather conditions you are heading out in. Check out this article which covers what to think about wearing. Anchor – An anchor can be very useful in an emergency situation to stop you drifting onto rocks or further out to sea. Food & Drink – Take more water and food than you expect to need, in case you are out on the water longer than planned. 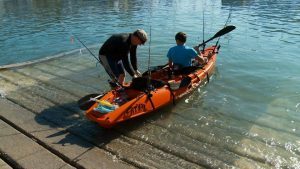 We hope this article on how to fish from a kayak has been useful, please comment below if you have any experience or advice you feel would be useful. 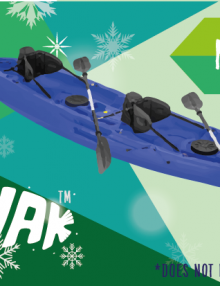 Related Articles: Top freshwater fishing locations in the UK, Kayak Fishing Equipment – a beginners guide, Choosing a Fishing Kayak.